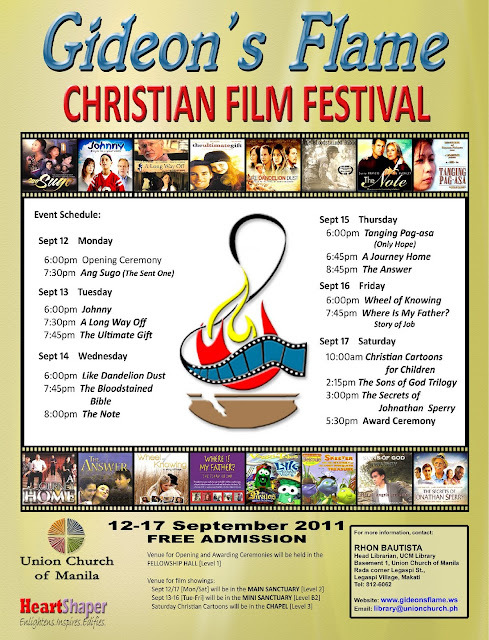 The Union Church of Manila (UCM) is holding the 3rd Gideon’s Flame Christian Film Festival (GFCFF) on 12-17 September 2011. The Festival seeks to know Jesus Christ, our Lord and Savior and in the process, recognize filmmakers whose projects expound on Christian teachings, Christian values and integrity thru the medium of film. The GFCFF is, so far, the first and only film festival in the Philippines to focus on this theme. Union Church of Manila is located at Rada corner Legaspi Streets, Legaspi Village, Makati City (very near Greenbelt 1). The 2nd Gideon's Flame Christian Film Festival was held on November 3-7, 2009 in the same venue. I was able to catch A Journey Home directed by Paul Soriano. You will be moved & inspired with these films. Bring your family & friends. Admission is FREE. If you have any questions, you may call (632) 8126062 or e-mail gideonsflame@gmail.com or ucmlib@gmail.com.